Well folks, the fall 2016 tributary season is behind us. The same conditions emblematic of the last few seasons returned to us once again. Low water, above average temperatures, and dwindling returns have become the norm. The dynamics of our fishery have steelhead anglers at an impasse. Learn to adapt to the present state of things, or stew over “how it used to be” and be constantly disappointed. No one can make it rain, trigger a run, stock more fish, or make it get cooler earlier. These are factors beyond our control. What we can control is how we perceive these challenges, and adjust our expectations. Here are a few reminders and pointers that we must keep in mind in order to adapt. We still have the most productive steelhead fishery in the world. Even in a down year, the Lake Erie tributaries continue to produce the highest steelhead catch rate per angler hour on the planet. Our fish are as well likely to be the easiest to catch due to the smaller size and higher clarity of our waters. Simple rigs can be employed with minimal investment, and with a little experimentation, success can come quickly. Extensive water reading skills are not required, as we can often see our steelhead. Drift boats and the complexities of locating fish in large rivers are not present here. Long casts and complicated presentations are not required skills. 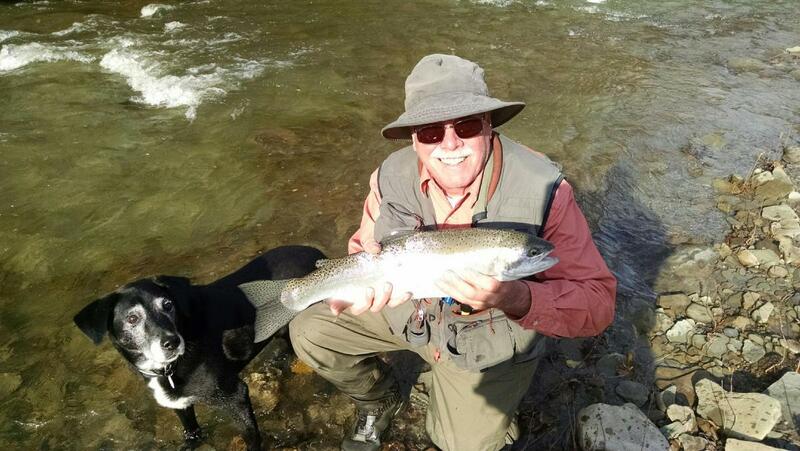 Erie steelhead occupy small to medium sized streams, and this serves the angler. Accessibility to our fish is cheap and easy. It does not take a flight to British Colombia, a mandatory guide, or an expensive lodge to gain access to our fishing. It simply takes a vehicle and a public access map. Crowded conditions are common as a result, but there are still many overlooked tributaries that go relatively unfished. I'll take crowded and local over empty and financially inaccessible anytime. This fishery is in our backyard, and in every backyard between Detroit and Buffalo. Our fish do not imprint and can be found anywhere where water flows into the lake. One of the best trips that I've had here involved trying to see how many creeks our group could catch a fish or two out of in a week's time. Many of the salmon fisheries to the nearby east and west shift to steelhead once the cold settles in. Few anglers take advantage of the winter. The trend of later and later run timing seen in recent years serves dedicated anglers. The reality this year was that our fishing did not truly settle in until Thanksgiving and beyond. Later runs mean less fair-weather fishermen. Crowds diminish after the first hard freeze up, and rarely return. Once water levels stabilize in the winter daily UV melt keeps everything at a near perfect level. A little rain to clear the ice, and a small warming trend are all it takes in the winter. When smaller tributaries freeze, steelhead often funnel into larger, open rivers. Ohio and New York’s larger waters are less prone to ice, and in recent years have stayed open most of the winter. Winter steelhead are easy to locate in deeper pools, and are eager to eat small flies. Our fish are willing biters when compared to traditional steelhead. Great Lakes steelhead don’t come from salt water environs. No major metabolic or physiological changes occur as there is no transition. They enter the system aggressive, and eat throughout their stay. Limited biodiversity in our streams means easy fly selection. Where else in the world can one find a group of steelhead actively feeding on a midge hatch? The selectivity seen in more fertile waters is rarely exhibited here. A few eggs, nymphs, and streamers is generally all it takes. The toughest part of our fishing is usually what happens after the bite. Detecting the strike, and dealing with obscenely light tippets are the real challenge. Often, I hear anglers gripe about only hooking a couple of fish all day. The reality is that the average angler doesn’t detect even 25% of their strikes. Every opportunity counts these days so it is wise to learn to hook the ones that bite. The concept of what constitutes a good day has to evolve with changing conditions. Nobody heads to the Cattaraugus River expecting Elk Creek numbers. What they head there for is a heightened quality of experience. The bigger, wilder nature of the Catt lends itself to what western steelheaders value far above numbers of fish caught. Much is to be learned from our neighbors out west. Some fish for months without ever making contact with a single steelhead, yet anglers persist. The unsustainable number of fish of the “good old days” represent little more than a curse on today’s fishery. The ridiculous catch rates of ten years ago did little to instill respect for the fish or fishery by many. Meat hunters still linger, and management policies are still at odds with promoting a quality experience. Steelhead fishing has historically never been particularly easy or productive. Instead, its difficulty and elusiveness invites dedication and respect. We need to embrace that. Well said, man. Adaptation is key. The fishery is changing.You can no longer stay in a 50' stretch of water and catch 20 fish. It requires being mobile and learning new water. Learn new techniques. Just like any other activity...when you quit learning you'll be passed.